Thanks Sherry K for this great recipe. 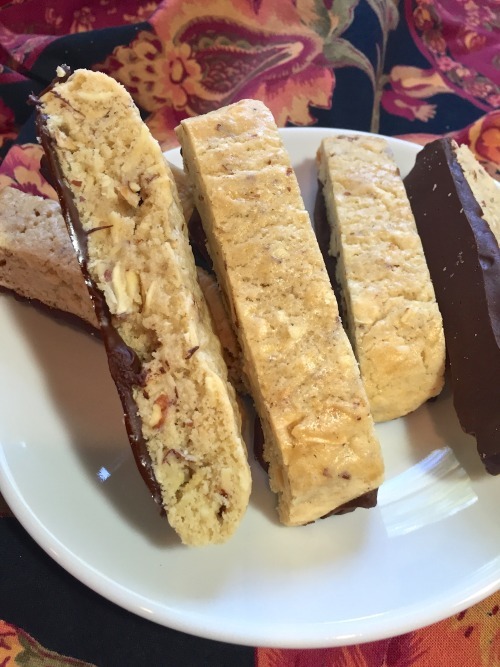 There’s a funny story about biscotti I have to share with you. Years ago when I was doing a lot of corporate catering I liked to try new recipes and drop them off at offices. 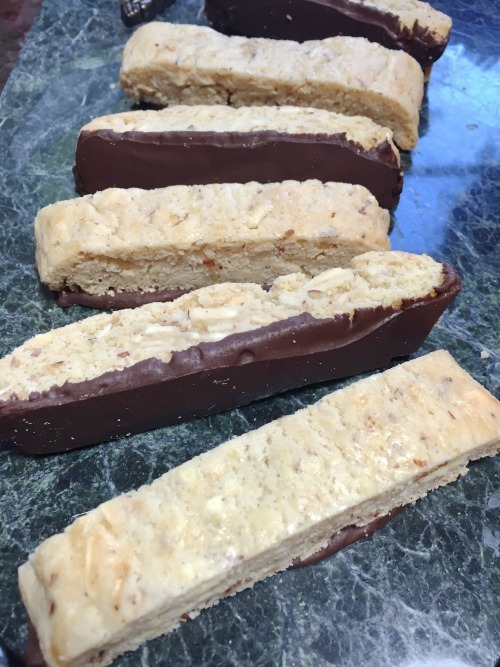 Well, once I made some biscotti and dropped it by a company and the next time I went in I asked the secretary how her boss liked them and she said he did but they were a little hard and crunchy. 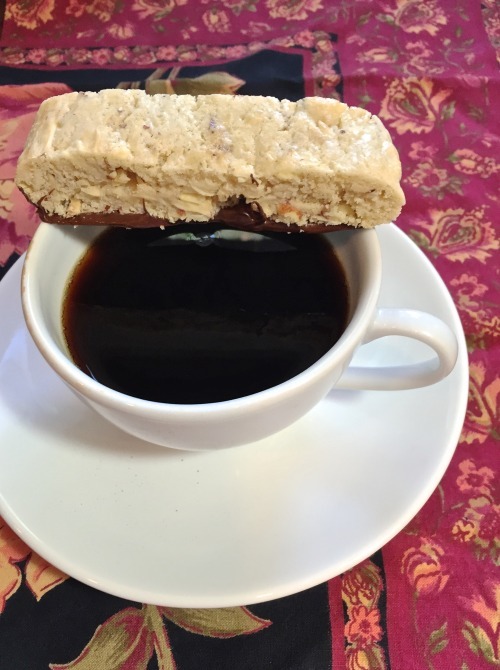 That was so funny, I guess he had never eaten a biscotti before and didn’t realize they are dipping cookies to be dipped in either coffee, hot tea or even a good cup of hot chocolate will do the job. These are so easy to make and keep so well I don’t know why I don’t make them more often. When I worked at Williams Sonoma I worked with another Sherry which I always called “the other Sherry”. 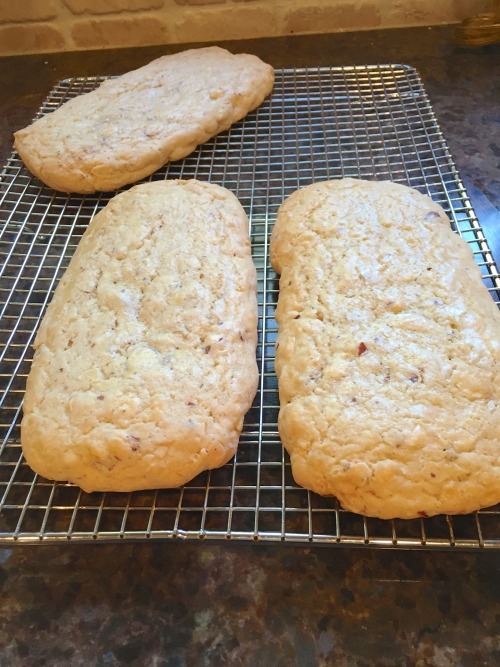 Everyone said her recipe for biscotti was one of the best they had ever tried. I worked there 6 1/2 years and never tried the recipe and years later I have finally make them and, in fact, several times. Who wants to pay $2 for one biscotti from Starbucks when you can have a jar full at home just waiting to be dunked in your favorite hot beverage. I like to add sliced almonds to mine because they make the slicing easier than the chunkier blanched or whole almonds. Adding dried apricots, cherries or any other dried fruits would be a great addition. Only the bottoms of my biscotti get a chocolate dunk. 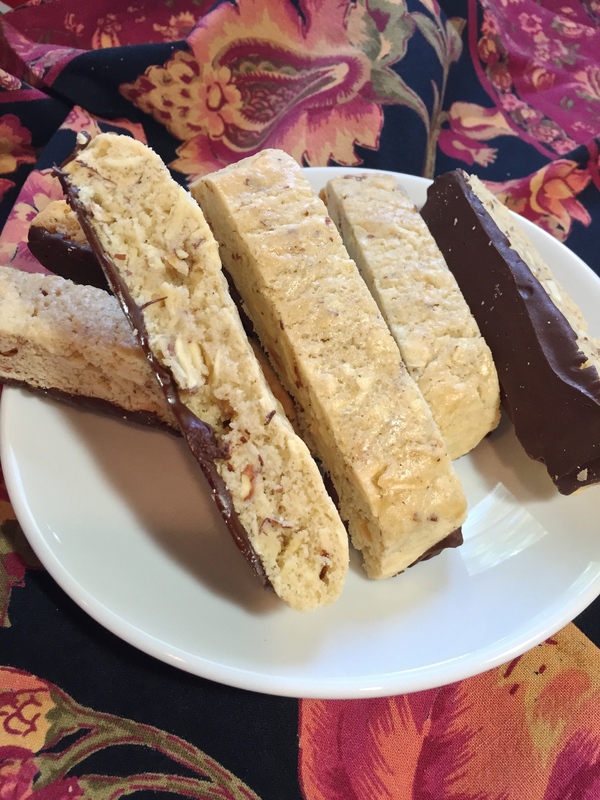 If you have made biscotti and put some different ingredients in your recipe, let me know by leaving a note below in the comment section. And, thank you Sherry K for sharing your recipe many years ago. BLAST FROM THE PAST: Raspberry Chocolate Muffins great for weekend breakfast. A plate full of chocolate biscotti. And, here’s how I made it…. 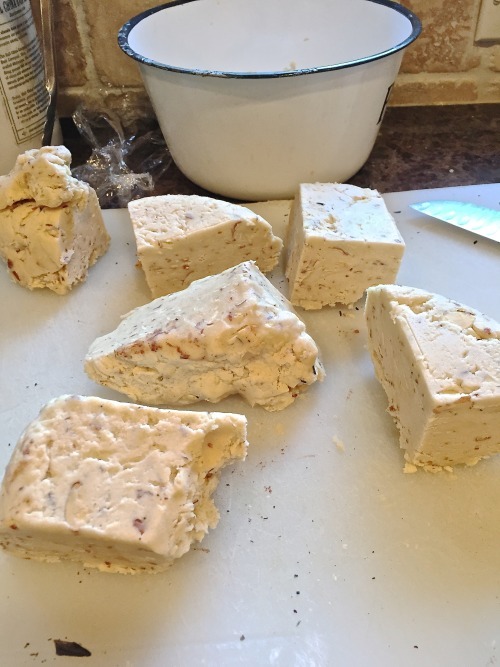 After making the dough, cut it into six pieces. I used scale to measure mine out. After baking 30 minutes, carefully remove from baking sheets to a cooling rack and cool for 30 minutes before cutting. Using a serrated knife, cut into 3/4-1″ pieces and put on cookie sheet about 1″ apart. Bake for 15 minutes or more until crisp. 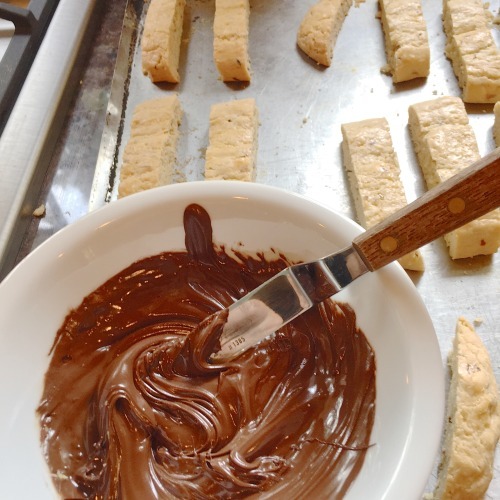 After the biscotti have baked and cooled, melt the chocolate and dip the bottoms (or spread with a knife) to cover. 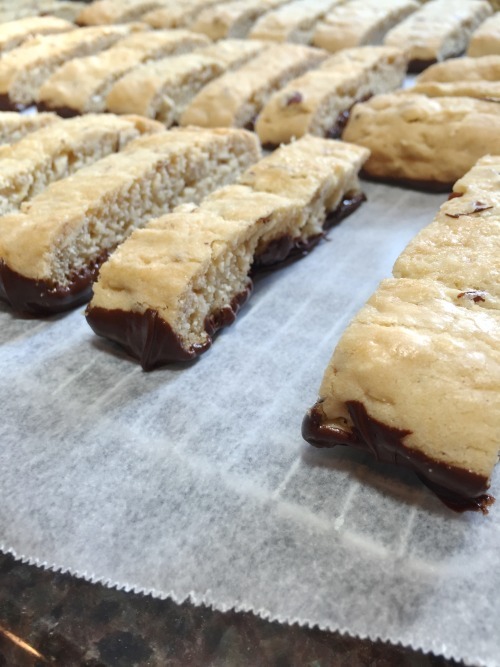 Set the chocolate dipped biscotti on wax paper to cool. I popped mine into refrigerator for about 10 minutes since it wasn’t setting up here in Texas. Now, sit back and enjoy one with a cup of coffee, tea, hot chocolate or a cappuccino. 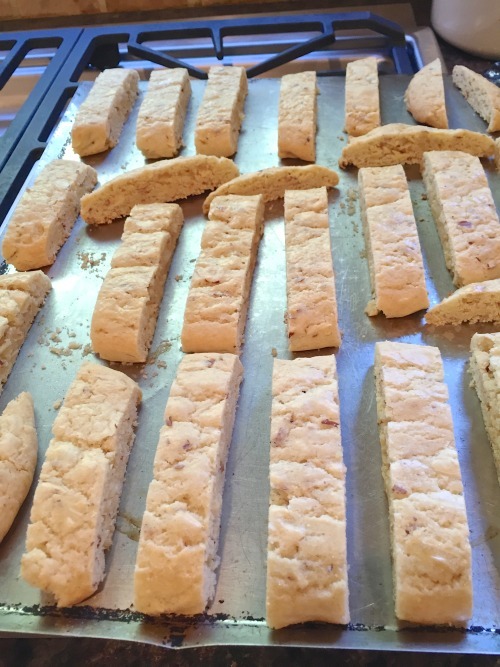 Quick and easy biscotti you have to try. Heat oven to 325. Lightly grease two large baking sheets. In a medium bowl, combine 4 cups flour, baking powder and salt. Set aside. In large bowl with mixer on medium speed, beat butter and sugar until light and fluffy. Add 3 eggs, one at a time, beating well after each addition. Separate remaining egg, placing egg white in cup and cover and set in refrigerator. Add egg yolk and vanilla to butter mixture. Beat well. Reduce mixer speed to low; gradually beat flour mixture into butter mixture until well blended. With spoon, stir in almonds. Refrigerate dough at least 2 hours or until firm enough to handle. Divide th dough into 6 equal pieces. Shape each piece into an 8" by 2" log and place across baking sheet. Combine reserved egg white and 1 teaspoon water and whisk until frothy. Brush logs with egg white. Bake logs 30 minutes (rotate 1/2 way through) or until firm and golden brown. Transfer logs to cutting board. Let cool 30 minutes. Using serrated knife cut each log diagonally into 1/2" thick slices. Arrange slices cut side down on baking sheets. Reduce oven temperature to 250. 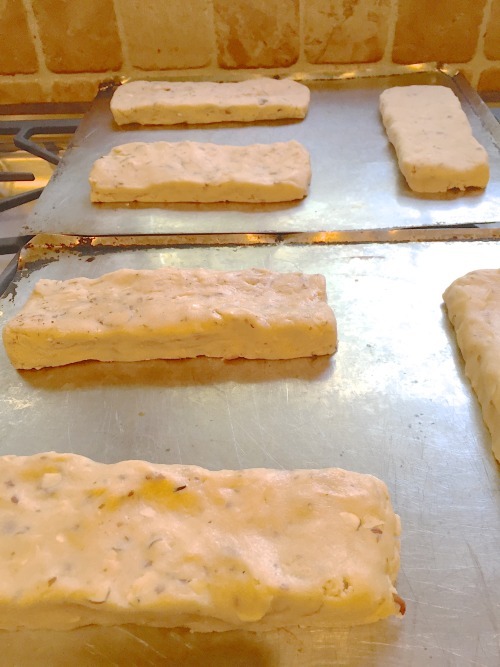 Bake slices 15 minutes or until dry on surface, turning once. Cool slices on wire rack and store in airtight container. Best if made one or two days before serving. Makes 48 slices and 12 ends. 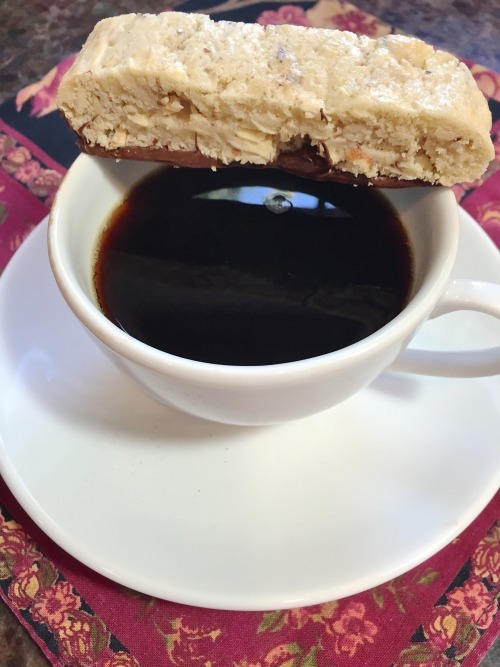 Can also dip half of biscotti in chocolate. To dip in chocolate, dip the bottom barely into the melted chocolate and set on wax paper to firm up.